"Cowboy Blues" is a mixture of folk, blues, swing, bluegrass and more, featuring originals and new arrangements of country blues standards. Dennis Roger Reed returns from his success with "Little King of Dreams" with this back porch influenced effort. Special guests include the legendary Chris Darrow on fiddle, lap guitar and vocals, and bottleneck and swing guitarist extraordinaire Mike Dowling. Besides recording two CDs as a member of the Andy Rau Band, Reed recorded three CDs as a member of roots rock band Blue Mama. He also produced and played on one CD with blues and roots band Suitcase Johnnie. "Cowboy Blues" is Reed's second solo CD, and continues his efforts to reflect the changes in small towns and rural America. There's more of a country blues flavor this time around, with Reed's own well-honed songs and some inventive re-interpretations. Don't be misled by the title of this new album from southern California singer-songwriter Dennis Roger Reed. Cowboy Blues is actually a delightful mixture of folk, roots, acoustic country pop and western swing, with the blues running through it as a common thread. Reed has an unassuming way with a song that conjures up images of summer evenings spent sipping lemonade and playing tunes on the front porch. His easy-on-the-ears baritone voice settles comfortably into both the toe-tappers and the ballads, and his skill on the acoustic, resonator and bass guitars is right up there with the best. The instrumental side of Cowboy Blues is made even better by the inclusion of some fine backup musicians, including Chris Darrow on fiddle, resonator lap guitar and backing vocals. Mike Dowling, and Reed's brother Don Reed add their talents on guitar, mandolin, and assorted other stringed things, and Dan Fuller provides jus the right amount of percussion exactly where it's needed. Of the sixteen tracks, six are traditional or covers and the rest are originals. My favorite among the covers is Reed's arrangement of the Blind Boy Fuller roots/blues classic Step It Up and Go which is spiced up a bit by the addition of some western swing style rhythms and fiddling. But the heart of Cowboy Blues is its original songs. Dennis Roger Reed has a knack for combining traditional sounding melodies with lyrics that speak of longing and love in ways that make sense in a 21st century world. It's hard to choose one over another, but I'm a bit partial to Murky Water, the opening track, and Color Blue, a memorable and melancholy ballad that refuses to fit in any genre. Cowboy Blues does what a good album is supposed to do. The music is a good mix of the familiar and the innovative, and the performance is top-notch. The lyrics catch your attention, tell you a bit about the singer, and reflect some of your own life and feelings. What more can you ask? Dennis Roger Reed doesn't look like a rock star. He looks more like the guy who brings his guitar to the church picnic to entertain the kids. His album, Cowboy Blues, features a picture of himself on the back, and he cuts a humble figure. It's a promising sign: this disc is about music, not flash, the photo says; here you'll find steak, not sizzle. And the picture isn't lying. Reed showcases a sense of pure musicianship over the album's 16 tracks, most of which he wrote, and which feature everything from mandolins to 12-string guitars and plenty of tight harmonies. The whole affair, from country swing to gentle bluegrass to acoustic ballad, is refreshingly classic in its approach. "Murky Water," the first track on the album, is a breezy 2 minutes that manages to combine a toe-tapping style with a tale of secrets and a "watery grave." Later on, "Steal That Guitar Rag" shines with the homespun mountain sound that's become so vogue since the soundtrack to O Brother, Where Art Thou? reintroduced mainstream America to mainstream Americana . Reed shows off his solid, crisp baritone on the pleasant "Goin' To Brownsville," a song so enjoyable you'll forgive him for actually wanting to go to Brownsville. The album's highlight has to be "Frankie and Johnny," Reed's arrangement of a traditional tune. It's a simple tale of love and love gone wrong, and Reed's pure voice adds to the grace of the music without every outshining it. The lyrics conjure up images of a better time, in a past that may never have existed: these songs are all about choosing love above all things, something not often sung about so plainly. Overall, Reed has created an album very much in touch with an old school, cowboy sensibility, a disc of honest tunes, honestly played. 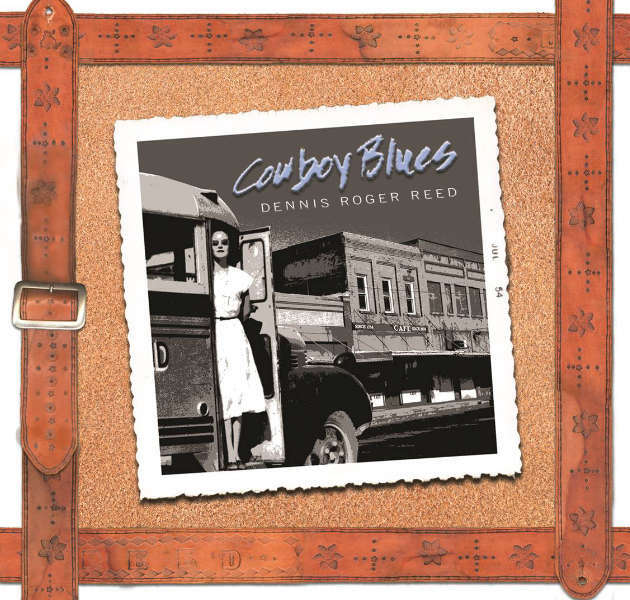 Dennis Roger Reed's Cowboy Blues (!) [Plastic Meltdown Records] shows he's a relaxed, melodic singer as well as an excellent guitarist. Thought blues based, he's more than proficient on an impressive variety of guitar styles, from folky strum to intricate blues picking to Ry Cooder-like eclecticism. About half of the songs are originals, good showcases for Reed's playing on acoustic, electric, and slide guitar. Covers included Sleepy John Estes' Goin' to Brownsville, and a live version of Smokey Robinson's Don't Look Back. Guests include former Kaleidoscope member Chris Darrow who lends his haunting fiddle and singing to the traditional Dark Hollow. The name Dennis Roger Reed will not ring a bell with everyone. That's a pity, because a year or so ago, the singer songwriter from California delivered a great cd with "Little King of Dreams'. Before that album he played as a bass player, songwriter and singer in the Andy Rau Band. He also recorded two albums with the roots/rock/blues band Blue Mama. On his latest album, "Cowboy Blues' he chooses for a sound that's a mix between folk, blues, swing and bluegrass that boils down to country blues. Luckily Reed doesn't forget the slide guitar in "Steal That Guitar Rag" and he also heaps loads of emotion in his music. His songs are clever and inventive, his delivery always driven and full of emotion. The result is a cd that's one of my favorites because of the tasty fingerstyle guitar playing but also because some special guest musicians are present, as the legendary Chris Darrow (on fiddle, lap steel and vocals) and the extraordinary bottleneck and swing guitarist Mike Dowling. Bluegrass and swing are fused on this cd, and blues is the glue that binds both. It's a real delight to hear such great musicians. The guitar playing is especially great, and also the singing is exceptionally good. Not hip or trendy but so unbelievably good that we think every lover of country blues should own this cd. Dennis Roger Reed is a great and promising artist, although, after these two nice cd's, you could also call him a very big talent. This one is partly Country Blues, although some of the original tunes (10 of 16) have more of a Folksy/Country feel. The instrumentation is mostly acoustic, with guitar, mandolin, resonator guitar, fiddle, banjo, hand drums, harmonica, 12 string guitar, and an occasional acoustic or electric bass (Reed played bass and sang harmonies in the Andy Rau Band), trap kit or Wurlitzer organ in various combinations. There are also some odd named instruments like the kanjira and the ghatam. The covers are familiar, such as "Step It Up and Go" (Blind Boy Fuller), "Wild About My Lovin'" (Jim Jackson), "Goin' To Brownsville" (Sleepy John Estes), "Frankie and Johnny" and "Dark Hollow" (a swinging version, with an electrified resonator lap guitar) the best examples. "Steal That Guitar Rag" is an instrumental, as is "Fudd Country Breakdown." It's all a very pleasant alternative to music that wants to beat you upside the head, and the booklet offers the bonus of some interesting vintage photos, including one of Lorrie Collins and Rose Lee Maphis signing autographs, although they are frustratingly small. Apparently Reed's family took him to some interesting Western musical events when he was young, and brought the family Brownie along, too. The whole effort is a throwback to an era when some artists didn't feel required to hit you so damn hard with the production, and thank goodness for that! I prefer music to be compelling, not demanding, and this music is. A slight departure stylistically is the Motown tune "Don't Look Back", done with a Reggae feel, but with banjo and mandolin, and sounds like it was cut live at a gig.